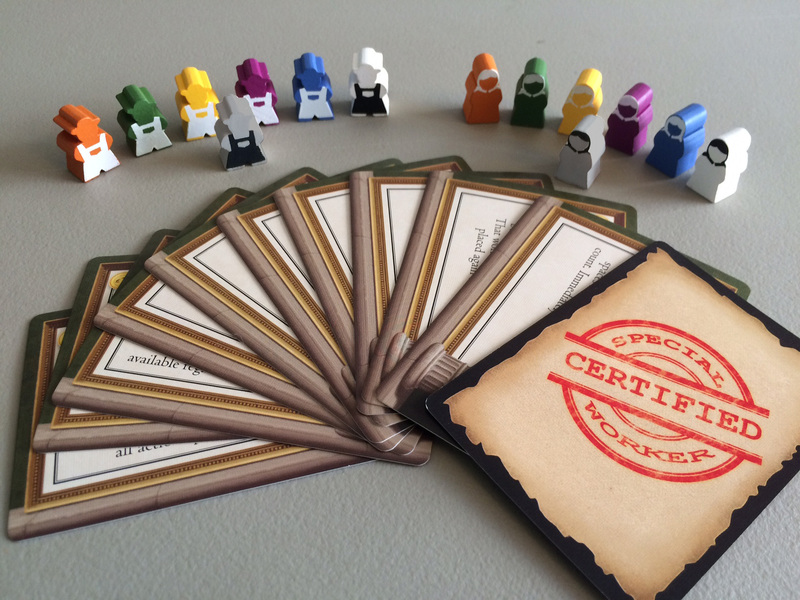 There are also 9 special worker promo cards (63 x 88 mm) that are available from Meeplesource. Removed Expansions: Which expansions were removed from the original version of Tuscany and why? 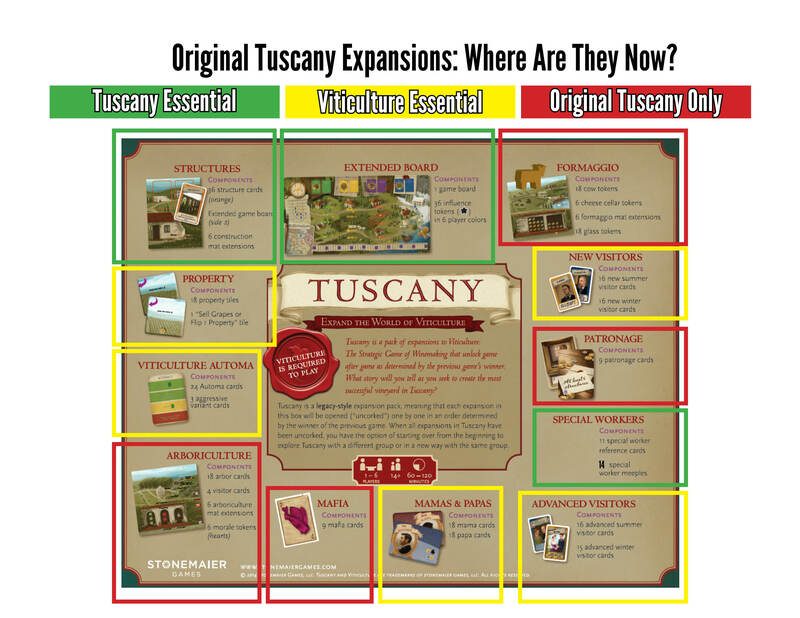 The clickable graphic in the sidebar shows in yellow and red the expansions that were removed from Tuscany. Some of them are now found in the Viticulture Essential Edition, while others are going out of print. We’re cutting the expansions in red (and, not shown on the box, the structure crossover bonus pack) because they’re not essential to the Tuscany expansion experience, and including them would double the price of Tuscany Essential. You can download the non-essential expansions here (and French download for Arborilculture) or purchase pre-printed versions here. Rules: Are there any rule changes between Tuscany and Tuscany Essential? The only overarching change is that Tuscany Essential is intended to be combined with Viticulture all at once (or as modules to pick and choose), while the original Tuscany expansions unlocked one by one. If you have Tuscany, you already have everything (plus a lot of other stuff) that is in Tuscany Essential. The only component change from Tuscany to Tuscany Essential is the new extended board is matte instead of glossy. Also, the Tuscany Essential rulebook now lists an official variant (recommended for 2-player games) in which the influence map on the game board does not contribute to end-game scoring. Other questions about the original Tuscany are answered here, and various versions of the original rulebook are here. Reviews of the original Tuscany are here, and a gallery of images is here. 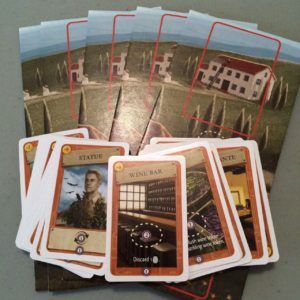 There’s a list of videos about the original Tuscany here, and the BoardGameGeek link is here. Compatibility: Is Tuscany Essential compatible with any edition of Viticulture? Viticulture Essential is recommended for use with Tuscany Essential, but older versions of Viticulture will work fine too. There is no overlap between Viticulture Essential and Tuscany Essential. The Viticulture Essential Upgrade Pack is a cost-effective way to upgrade your second-edition copy of Viticulture to an Essential Edition. Meeples: Why doesn’t Tuscany Essential include all of the original special worker meeples? As we budgeted for the Tuscany Essential Edition, we realized just how expensive 66 large, silkscreen printed, custom wooden meeples are. Including them would have increased the MSRP of Tuscany Essential to $50, which is too expensive. The gameplay of the special workers expansion is exactly the same, as there are still 11 special worker cards. It’s just that there are only 2 types of meeples to represent those abilities. There are 2 in each color (one man [former Farmer] and one woman [former Innkeeper]), as well as 1 of each in grey. The 2 grey workers will be assigned to the 2 special worker cards drawn at the beginning of the game so players know which worker has the corresponding ability. Other Questions: Where can I ask them? Please post questions in the comments below or on the Viticulture/Tuscany Facebook Group. Why did I pre-order this instead of waiting for retailers to receive Tuscany Essential? The main reason is that you might be waiting quite a long time for the next print run if you didn’t pre-order. We expect nearly all copies of Tuscany Essential to go directly to participating retailers. Those retailers will fulfill their pre-order customers right away and then wait for the official release date to sell to other customers. After that, we may or may not make another print run–it all depends on demand. Also, if you pre-ordered during the campaign, you got the 9 promo cards for free. Here’s a detailed explanation of how this system benefits both customers and retailers. Other Products: Can I order Moor Visitors or Viticulture Essential? What about the metal coins? Depending on the retailer, they may offer Moor Visitors or Viticulture Essential. The metal coins are only available directly from us here. If your favorite retailer (online or local) isn’t on the following list, ask your preferred retailer to carry Tuscany Essential. 1) The “Original Tuscany Expansions: Where Are They Now?” image quality is poor. You can barely make out the titles – let alone the subtext under each. 4) I noticed when you click on “Subscribe for Launch Notification” the capitalisation of the subscribe form is inconsistent. ie Email Address, Country, full name. Looking forward to the preorder campaign! I agree with points (1) and (2) above. In my quick read-through all my questions were answered. I already made those changes yesterday–can you help clarify which points you’re agreeing with? The image is now clickable in the sidebar. These should probably be in separate paragraphs, or in the opposite order. Right now it sounds like the 9 special promo cards were a part of Tuscany. Speaking of which, you should probably say whether these 9 special cards represent a sub-group of the 11 (presumably printed differently), or a different group of cards, or something in-between. Also, the board you pictured does not include structures. You might want to mention that the reason the board is two-sided is to allow one side for structures and the other for no structures. 2 Are there any rule changes between Tuscany and Tuscany Essential? 3 Why doesn’t Tuscany Essential include all the original special worker meeples? 4 Which expansions were removed from the original version of Tuscany and why? Agree with the major points above. Slightly confused by the dash before the 20 minutes per player/ $30 MSRP. It looks like the expansions reduce the game length – I am sure most people will understand but …. Thank you all for your helpful comments! I’ve updated the page with your suggestions. “Which expansions were removed from the original version of Tuscany and why? However, the sidebar is more of a “bottom section”, as it is actually well below where I’m currently typing this on the mobile page. Small thing, but I definitely searched around the top of the page for a bit before I scrolled all the way down. Presumably the box art in the main photo at the top of this page is going to change? If so, it would be good to make this clear. A couple of other small things: (1) It would be good to update the formatting of the title ‘FAQ’ to use heading 2 or 3 and not just in bold like questions; (2) You could hyperlink your email address in the ‘How to Pre-Order Tuscany Essential’ paragraph. Dave: Yes, I should be updating the box today. Thanks, I can see that confusion. I’ll adjust the phrasing. Do ambassadors get a preview of the 9 new special workers? I guess I will be exapnding my Collector’s Edition again (this is not a complaint). Eric: Are you on Facebook? I posted a preview of the cards on the Viticulture/Tuscany group there a week ago. The promo pack will just be a set of cards (it’s much easier to package and ship that way). For people like you who have the original Tuscany, in 1-5 player games you can just assign the another color of worker to the cards. In a 6-player games, you’ll pile up each worker type on the special worker cards as a visual cue. So really the only difficulty will be if in a 6-player game if all 6 players train all of their special workers, but by that time players should know which is which. I have heard about facing books, but the view out my window is much better. :) I’ll try to scope them out. Also, for those with regular Tuscany, when we but the new promo cards, will be be able to buy the gray workers with them? I will say no more, but expect completionists (like me) to hound you over the gray workers as a separate purchase or with the promo cards. I have Tuscany already and want a complete set. Randal: The meeples aren’t new–if you have Tuscany, you already have them. It looks like the players’ special workers in this set are the same as the Farmer and the Innkeeper in Tuscany. Thus, as Jamey said, anyone with Tuscany already has those pieces. I agree with Eric — I already have Tuscany, but it would be nice to have a way to get the 2 grey special workers. I don’t understand anything that’s going on with the various names for Tuscany. Say I want the base game and all the expansions, what do I need to get and is it possible? I can’t seem to find Viticulture anywhere. If you want the base game and all the expansions, you’ll need to buy Viticulture, the original Tuscany (which is very hard to get), and Moor Visitors. Viticulture is in stock–just ask your local or online retailer to stock it for you. I can’t wait to get this and the Essential Edition Upgrade Pack! I was reading the Tuscany Essential Editions rules and I wasn’t sure if this was a typo or not. Good catch! That’s right, it doesn’t need to mention patronage. Hi there, I’m trying to follow your instructions for the Pre-Order of Tuscany Essentials Edition but I also see there is a date range that starts in July. Is that when the pre-order will be available to be made at the online retailers? 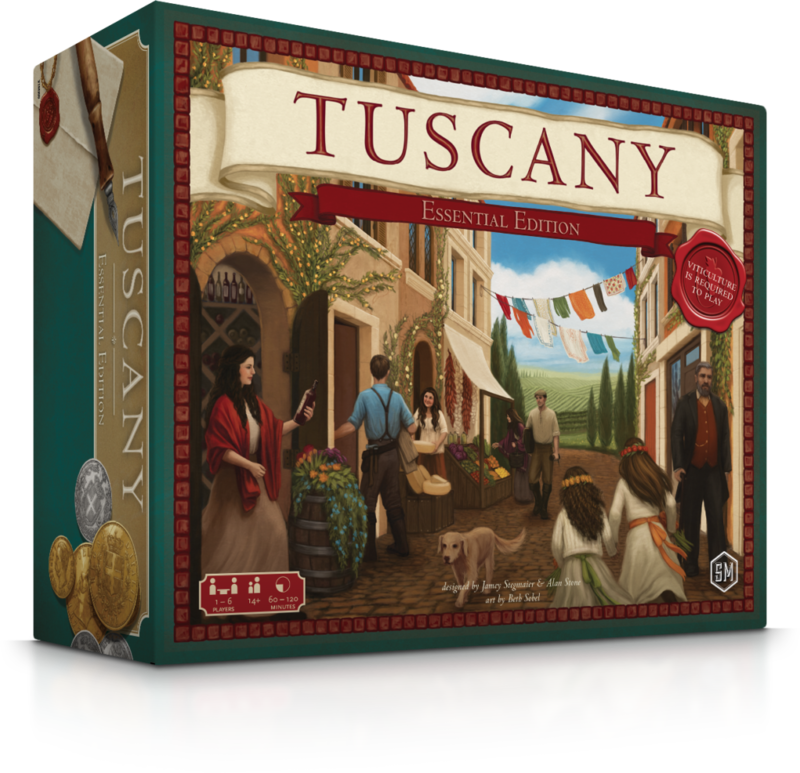 That’s correct–you will be able to preorder Tuscany EE from retailers starting on July 13. Jamey, thank you for the heads up. I have one more question and I apologize if I missed this detail. 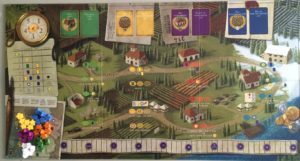 I recently order Viticulture Essentials (didn’t have the original Viticulture) and a copy of Tuscany from a user on BGG. I noticed that Viticulture EE has some nice rule changes that Tuscany seems to be missing. So I’m curious if I should donate Tuscany to a friend and go with Tuscany EE; if the new board with Tuscany EE is going to be updated to the nice matte finish with the new rule changes. If it’s going to be identical to the existing Tuscany board then I probably will just hold onto it to keep Formaggio and Aboriculture. Are the changes I’m interested in going to be in Tuscany EE (if you can divulge the answer). Rob: The board will be identical except matte instead of the original glossy. There are no rule changes in Viticulture EE that impact the extended board. Okay, cool. Maybe I missed something on the board. That’s great to know. Thanks Jamey. I want to play all rules. But, I don’t get some rules with Tuscany Essential Edition and Viticulture Essential Edition. Will you reprint these rules in some form or other? Ken: Tuscany Essential will come with the Tuscany Essential rulebook, which complements the Viticulture EE rulebook. If you’re looking for a specific rulebook, we have them all on our website. Says the curmudgeonly grammarian: “everything than what”, than what a curious expression! Jasmine: Thanks for your question. To have all the expansions, you need the original Tuscany and Moor Visitors. 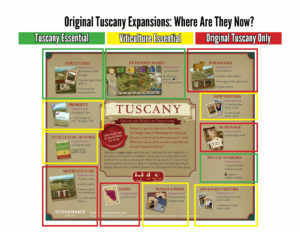 5 of the expansions in Tuscany (which are expansions that some people use, but we’ve deemed them non-essential) have been removed, so Tuscany Essential only has 3 expansions. I have to make a complain here, that contact from PORTUGAL is not working. Or its ignoring requests. Duarte: Thank you for letting me know. I’ll contact him. Just wondering what the card sizes are, for sleeve purposes. Tod: The structure cards are 44x67mm, and the special worker cards are 57x87mm. Thanks Jamey. I got Scythe, and ordered Tuscany EE, last week; so keep up the good work. Same length and width, different depth. will there be a german translation of Viticulture Tuscany Essential Edition. My attempts to get an answer from Feuerland-Spiele, who translated Viticulture Essential Edition was unsuccessful, as they only referred to the original Tuscany Edition. Miguel: We’re not sure yet, but I’ll talk to them about it. Thank you for talking to them! Congratulations for this board game! Great! Begin to say how much I like this game and with Tuscany Essential it flat out awesome! In my humble opinion the best expansion ever made! 1b. With the Apprentice; Does it mean your Grande has to be among your available workers or do you pull him from an actionspace you have already used him at in current or previous seasons? 1b. If the actionspace taken by your Apprentice had a bonusaction on it, does your Grande receives that aswell meaning you’ll get a double bonus? 1c. Say you do get double bonus and the actionspace you recieved twice is one that grants you a card, can you use the lira, VP or whatever you got from the first card to fulfill the requirements of the second card given to you by your Grande? Thanks for your questions! The Apprentice reads, “After taking an action with the Apprentice, you may immediately place your Grande Worker on the same action (not on an action space).” Your grande worker needs to be available (i.e., not already placed) for you to do this. Any worker only gets a bonus if it’s placed on a bonus action space, so in this case, because the Grande Worker must be placed “not on an action space,” you can’t get a bonus. As for general rules for getting bonuses, you can gain the bonus before or after you take the action (or not at all–the bonus is optional). Given your answer above, please can you clarify the idea/purpose of the apprentice? Is the advantage offered the ability to allow the Grande Worker to duplicate an action on your home board that would not usually be a legal move? It’s one of a few times in Viticulture where order of operations may be beneficial to you. That is, doing the same action twice in a row might be better than taking that action on subsequent turns. Were the 9 promo cards supposed to be in the box or a separate card pack? Asking since I preordered from Miniature Market and didn’t receive the promo cards. Chris: They’re in a separate pack. We sent them all to Miniature Market, and they should have shipped the cards with the game. If you poke around in the package and can’t find it, just contact them and ask for the missing component. I preordered from Funagain Games in July, but I didn’t receive the 9 promo cards. Was I supposed to receive these? Aaron: Yes, Funagain should have sent them to you if you pre-ordered in before November. Sometimes they’re in the courier packaging and people missed them, and sometimes they’re just missing. If you contact Funagain, they’ll send them to you. Hi, I have the Complete Collector’s Edition from the kickstarter. Is there a way to get a copy of the special workers promo cards? I see you can order the cards but where can I get the two grey meeples? Randal: They aren’t available separately (they’re not needed). Thank you. I suppose they don’t ship to Europe (Italy), or am I wrong? I am wondering new rules about “End of Year Upkeep”. I’m inclined to house-rule retrieving workers after everyone passed out of winter. Because removing them in middle of other players turn seems a bit “asymmetrical” compared to other seasons. I feel like winter isn’t rewarding first player on wake-up chart enough (or punishing players that choose to go later), it’s rewarding one with most workers. So my question.. Is there something that came out during play-testing that I’m not aware? ..or is it put that way just to simplify upkeep rule? Davor: There are several reasons why I would highly recommend you not house-rule this. First, it’s intended to be a balancing mechanism between waking up early and waking up late. Players who wake up early get to go first each season, and with the Tuscany board having 4 worker-placement seasons instead of 2, that’s a big deal. Second, one of the major pieces of feedback I got about Viticulture was that because a huge part of the game is about building up to a big payout the last year (or during crucial years). That can create a big stopgap in the winter, creating situations where players will really need to fill orders, but they’ll be unable to do so. Third, the Tuscany board is all about an even flow from one year to the next. A game manager isn’t needed to tell everyone to retrieve their workers like in Viticulture–it’s simply built into what each player does when they pass out of winter. Thanks for clearing that up. I guess that in two player game this isn’t as obvious as it is in game with 3 or more. I have to buy the old version of tuscany ? or you will make available those expansions soon in any sort of kit expansions ? Just completed a 6 player game of the Tuscany E.E. expansion (without the structure cards). The winning player didn’t plant any vines or fill any wine orders. They sold all of their fields, had a tasting room from their papa card and relied on visitor cards, tours and the trade action to buy victory points. Seemed like a legit play/win, according to the rules, but it broke the experience (and spirit) of the game from my perspective. Did this come up in play testing? Did you consider creating a negative modifier or cost to having all of your fields mortgaged? Could have been a one time lucky thing (right cards at the right time) – definitely going to try again. Would love to hear your thoughts. Mike: Sure, there are lots of ways to gain reputation while running a vineyard. We did test such extremes, and they’re a viable way to play. I personally prefer to make wine, and I generally fine it’s more effective than circumventing that process. I have a question. Is it posible to play the expansion with the Automacards? I have the question, because there are more posibilities on the new board. These posibilities are not on the Automacards, how does it works? I didn’t find extrarules for the sologame. Sabine: They’re on the Automa cards–just look for the little “T” on some of the actions of those cards. They work the same way as Viticulture. Hi, thank you for the answers, I have vergotten to say I have the German game from Feuerland, is it also posible? I like the solomodus very much and often played it. Ah, I see. Yes, I think Feuerland removed the T without realizing its importance. Have you contacted them to see if there’s a solution from their end? I have to report that the Italian version of the manual available online is plagued by typos, basically looking like it lacked any proofreading. I count three on the first page alone, with a lot more after. It probably is just a draft of the final cut (the file has been last edited in june ’16, after all), but in case it isn’t, please be sure to fix. Thanks for the heads up! I’ll upload a new version of the Italian Tuscany Essential rulebook soon. Hi Jamey, are you planning to release a French version of Tuscany Essential Edition anytime soon ? will there be a german version avaiable in (near) future? ..before i buy an english copy, you know..? I think so, but I’d recommend asking Feuerland. Is there any plans on re-releasing the arboriculture expansion again? The wife and I just got the essential edition and Tuscany expansion but would love another expansion! Already have as well as the metal coins (which are awesome BTW). Thanks for the quick reply. I guess I shoulda read up top before asking lol. Keep making great games, we love Viti, Scythe and Charterstone! Cheers! Hi Jamey, it’s possible to have the Tuscany Essential Edition Summary v3 in french version ? Ome51: It doesn’t look like I have that file, but if you ask Matagot for it, they should be able to provide it. Jamey, is there a new printing of Tuscany EE coming? We just recently sold out, and we’re making more, but it’ll be a few months before it’s back in stock. Some retailers are sure to still have it, though. Jamey, I’m just getting into Tuscany EE and loving it! One question – on the wake up chart, does “Age Grapes” mean just that? i.e. wines are not aged? I’m thinking only grapes, as your rules wording is usually very precise. Thanks and thanks for the great game! Chris. Thanks Chris! You’re correct–the special bonus on the wake-up chart is only for aging your grapes. It’s below the chart (during end-of-year cleanup) that you age both grapes and wine. Thanks for the quick reply! That’s what I thought. I wonder how many are aging wine as well on the wake up chart? Where is the space that says sell one wine token?…. I see fill orders. Sell and trade grapes. But never sell wine. This is extremely confusing and there are no forums or questions on this. Ive looked. How does the cheesemonger work Jamey? Thank you :)! P.S. loving viticulture. I have everything minus the 9 promo cards. looking for them. And no metal coins.